Man, I have worked hard over the past several months to make sure to post on the blog at LEAST once a week. And now I have left 2 weeks slip by! I’ve been pretty busy here. After coming back from my vacation I unpacked, got some house cleaning done, and then my whole family, including myself, promptly fell sick. It was a tough two weeks with fever, body aches, upset tummies, the whole bit. Ugh! 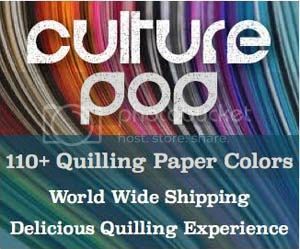 During this time I also finally made the decision to stop, for the most part, selling paper quilling supplies. I, like everyone, only have a limited amount of time at my disposal, and I need to prioritize. Besides being a mom I also homeschool my 7 year old daughter. So in addition to cleaning, cooking, playing, crafting, etc. I need to plan lessons and teach her (with my toddler around as well, quite a challenge!). Therefore I need to really decide what else it is that I do that I love enough to keep on. I love doing my paper quilling, so that I will not stop. I love sharing tips and tutorials, so that I will also not stop. Therefore it was obvious to me that this blog is one of my favorite and most important aspects of my paper quilling. 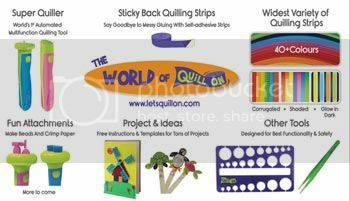 Selling supplies, on the other hand, is something I have done partly for some extra crafting money but mostly as a service to those in Malaysia and nearby countries who are doing paper quilling and want a more local source for their supplies. But it has become more apparent to me over the past year that this is not something I can keep up with. I enjoy being of service for those who need supplies, but I sometimes dread the weekly packing up time in order to send out the orders. It’s just that I only have so much time and there are other things that I NEED to be doing (especially with regards to homeschooling) and that I don’t have the luxury of spending a few hours each week wrapping up orders for the mail. So, while it became obvious to me over the past year that this was something that I was going to have to let go at some point, I also didn’t want to let down my customers. Especially my local repeat customers. Thankfully my husband had the great idea to find someone else who wanted to take over. I have spoken to a colleague who is willing and excited to take over the supply business. There are some products that I sell that noone else sells here in Malaysia. This person will take over some of those products so that they will still be available! The fun part of this news is that I am having a HUGE SALE in my online shop to clear most of my stock! Click here to browse! Every single thing is on SALE!! I will be still making a couple smaller stock orders this month, but by the end of February I plan to close the online shop. I will then list whatever stock I have leftover in my Zibbet shop. I will continue to keep stock of some of the basic supplies in my Zibbet shop for those who can’t get them anywhere else and still want to be able to purchase them. Eventually as my colleague takes over all the supplies and opens her own online shop I’ll stop selling supplies completely. I will still sell my premium tutorials, though, and more will be coming!! In the future as my responsibilities change who knows what will happen and whether I’ll start selling supplies again, but for now I know it’s the right step in my life to take a step back from it to focus on more important things. Another fun part of this news is that it means in a couple months I’ll have more time to devote to the blog! I have SO MUCH to share with you guys this year, I’m so excited!!! New tutorials, new reviews, new tips, SO MUCH FUN!!! My next post will be my yearly end of year review (a bit late this year, sorry!) and then the fun posts will begin! Is there anything you’d LOVE to see on the blog this year? Send me an email or leave a comment here, I’d love to know! I have found myself in a similar position. It’s not fun to have to stop doing things you love. The good part is, that it sounds like you eliminated the task that gives you the least satisfaction. I love that this will free you up to write tutorials and share your quilled work. It was also so kind of you to make sure your customers are taken care of. I’m excited to see what comes! Yes, I feel blessed that I have the ability to choose what it is I want to do most! It’s great that you’ve identified what you love so you can keep focusing on what’s important to you. If you keep stretching yourself thin, you won’t be do what you love – congrats on your new focus! Good luck to you on your new path. Your daughter is very blessed to have such an involved mother who knows family comes first. I look forward to seeing whatever you share in the future.